mwe3: Your new CD Reality Of The Fantasy is really excellent. Is there a story behind how the CD came about, including how you came up with the title, and how you ended up recording, mixing and mastering up at Will Ackerman’s Imaginary Road studios? JAMES SERA: Thank you, I appreciate the kind words. This CD is very special to me, it's very personal and it's the first time I ever put something out there for people to listen to. This album is a real learning experience on so many different levels. There are so many different things and events that inspired or helped shape this album. Right off the bat I would I have to say the event that really inspired me to play solo acoustic guitar was Kaki King. I saw her open up for Tony Levin at the Bottom Line in NYC. I'm not even sure she had an album out then and she blew me away. I had never seen someone with just an acoustic guitar and no backing band captivate an audience like that before. 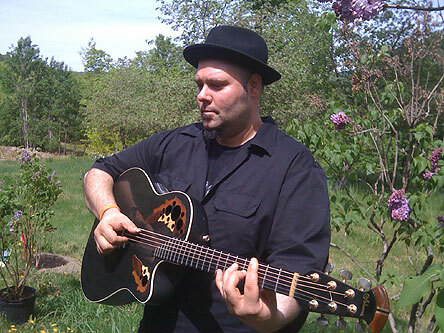 I had always been into instrumental music, but a solo acoustic guitar instrumentalist really appealed to me not only as a guitar player or as a songwriter/composer but more important, spiritually. I felt instantly like an inner calling to pursue this form of music. To be able to tell a story or convey a feeling or an emotion with just one guitar, wow! Naturally the music went through many different phases. At first I played with a pick and originally I was doing everything on my electric Steinberger Strat. As I delved into the music more, I became enamored with solo instrumental artists like John Fahey, Robbie Basho and Leo Kottke. Then of course the Windham Hill guys like Michael Hedges, Will Ackerman and Alex DeGrassi. The origin of the title Reality Of The Fantasy is something I came up years ago when my roommate with a mutual friend snuck backstage at an Alan Holdsworth concert and my friend asked Mr. Holdsworth if he had any words of advice for a young musician and according to my roommate Holdsworth told him "Hope for the best and expect the worst." I thought that was such an honest answer. I thought wow, isn't that a reality of the fantasy and that has always stuck with me. There is a reality to every fantasy in life. Whether it's going on a date, a new job, going somewhere new. Every fantasy or thought we conceive has a reality to it and that reality can exceed our expectations or it can be a lot more painful or difficult than we ever imagined as well.The Reality Of The Fantasy in essence is the truth. Not what we tell ourselves to be the truth. It's the moment we awaken. When it came time to record the album there was no other place I could even think of besides Imaginary Road studios. The history and energy of music that has been recorded there. I feel very fortunate to have recorded this album there. mwe3: How interconnected was the process of recording, mixing and mastering and describe your involvement from start to finish. The CD has a great sonic edge in my opinion. JS: I would say very interconnected. The energy that Imaginary Road also played a real important part as well, it was very inspirational. The studio is high atop this beautiful scenic land in Vermont, that is just beautiful. The studio itself was built by Will using wood from the land. There are moments on the album that was made up a few seconds before the red light went on in the studio. We did most of the recording in the winter which had such a great atmosphere, snow everywhere, being in the woods, getting dark early, it was very inspiring. We did some additional recordings and did all the mixing and mastering in the spring and that had a very different vibe to it. The weather was warm, bright colors all around, it was really beautiful. Of course I would like to say that working with Grammy award winner Corin Nelsen was one of the best recording experiences I have ever had. The man is amazing. He is so proficient, hard working and really an expert on getting a good sound and setting the pace to get maximum results. But the first thing Corin said to me while I was tuning and checking the sound levels was "Don't hold back, play as you feel." I said to him don't worry I'll keep in mind the mics and the levels." He looked at me and said “don't worry about that, you do what you feel, that's my job is to worry about that stuff." I felt so good and instantly comfortable with Corin. I can play very loud and aggressive and the next second play real gentle depending on the song, which sometimes drives other engineers a little crazy. At that point, I knew we were here to make a record. I'm really happy how the overall sound turned out. With the mixing and mastering Corin suggested to keep it clean and natural sounding. I don't know what I would have done without him. It was one of the best recording experiences I have ever had. 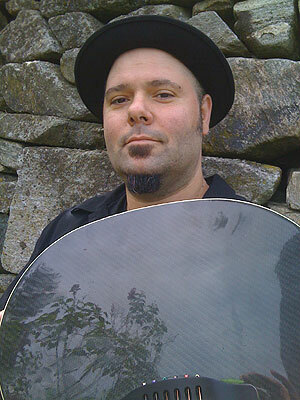 mwe3: The Will Ackerman influence is there but what other guitarists inspired you to pursue the cutting edge New Age / acoustic instrumental guitar sound that you feature on the new album and what other musicians, guitarists and bands inspired you to become a performing musician? You mentioned that you were also influenced by progressive rock bands such as YES, so I guess, multifaceted guitarists such as Steve Howe had a definite impact on your playing and recording. JS: Although this album is intended to soothe, I think there is some dark moments on the album that I would consider more ambient in nature, I tend to gravitate towards the term ‘psychedelic folk’. Ambient music and psyche-folk music can have very dark overtones. The album is really a reflection of where I was mentally and spiritually in my life at that moment. My younger brother George who I dedicated the album to is dealing with an aggressive form of MS. I have lived my life not believing in myself, I couldn't even play guitar if someone was in the room with me. I would be so self-conscious, my mind and my fingers would just freeze. I was really unhappy with my life and where I was. Between that and my brother, I could not listen to loud, fast paced, get up type of music. I couldn't sleep at night. I couldn't clear my mind. So the music that I was listening to was a reflection of that. I listened to everything from George Winston a lot of Basho, Fahey, Kottke... Returning by Will Ackerman. Classical composers like Satie, Glass, Reich, Riley... I got into a lot of ambient music as well. Pink Floyd has always been a big influence as well. The way they have that very relaxed, slow, atmospheric feel. I'm a big Yes fan, “Mood For A Day” was the first solo acoustic guitar piece I ever learned on the guitar. I think I was about 14 or 15 when I learned it. Yes has always been a part of my life musically. Their music has been with me at some very pivotable moments of my life. When people who maybe are not aware of the genre of solo instrumental music if they ask me to describe the music on the CD and I know they know who Yes is, I might jokingly tell them that the album is if Jon Anderson played acoustic guitar like Steve Howe with a dash of Pink Floyd. I think this album should be viewed as one big piece. it has a certain flow not only conceptually but also for the listening aspect to it as well. I wanted to create on one level an almost journey type of listening experience. The conceptual aspect is that it starts out with the song "Wish" as the introductions and once upon a time and sets a certain tone as a very dreamlike state.“Wish” for me has a very airy, dreamy feel to it. The second song "The Ascension" is almost is the opposite of “Wish”, it has very dark overtones to it, something lurking around the corner as opposed to the bright feel of “Wish” and then it goes back into the story with "Day Of Celebration" which is a very upbeat feel good song that still retains a very strong emotional feel. For me that song is like a first dance at a wedding or a birth, its a moment of love. Track 8 which is the title track is the climax of the album and then track 9 "Someway, Somehow" sums everything up and ends the story. mwe3: Can you say something about your favorite guitars and specifically about the guitars you played and recorded with on the Reality Of The Fantasy CD? How about favorite guitar strings and other gear, effects, amps, etc. that you use to achieve your sound live and in the studio? JS: Everything was recorded on my Adamas guitar. Which has the carbon fiber top. I love it. It has sound characteristics that gives it a very unique sound and a feel that is all its own. Everything was recorded dry with various placed microphones and we did use a direct line into the board from the guitar. Live is a different situation, I have been working on my live sound. What's good about being a solo guitarist is that I can just mic the guitar and plug directly into the PA. What I'm trying to do is add consistency with my live sound. I'm toying around with various compressor, delay and reverb units. I just got an Aural Bass Xciter, I love how it really adds some nice low end frequency and fullness to the overall guitar sound. mwe3: Can you say something about your guitar technique? 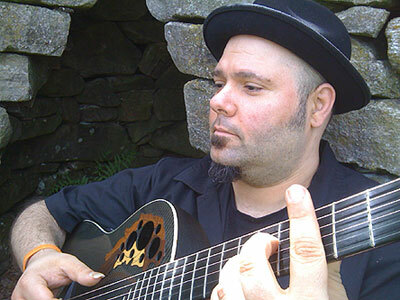 Do you play mostly finger-style and also do you use guitar picks, capos and what kind of guitar tunings do you prefer? Do you practice and can you remember your first guitar? JS: I like to play with the volume, the duration and the suspension of notes, I like to play with the tempo. I can be very gentle and I can be very aggressive on the instrument. I kind of subscribe to the classical technique where for the most part the third finger handles the high E string, the middle finger handles the second, the index finger handles the 3rd G string and the thumb tackles the top 3 strings. I am a firm believer of practice. I always have a guitar in my hand whether I'm watching a movie or hanging out and socializing. I also think practicing has to be broken down into different specifics. Practice scales, chords and technique for improvisation and to expanded your knowledge. Practice songs for repertoire purposes, even if they are your own. Practice song writing, even if it is just creating something that sets a tone or a mood. Try to create something in a different genre that you normally don't play...jazz, country, blues, funk, folk, metal, indie, punk... Try to come up with something that conveys different moods. Something happy, sad, scary, romantic etc. Create for the sake of creating. The more you do something the better you get at it, that includes sight reading as well. I got my first guitar at the age of seven. My first good guitar was when I was 11 it was a Guild X-79, that I picked out with my Dad in a pawn shop in NYC for Christmas. 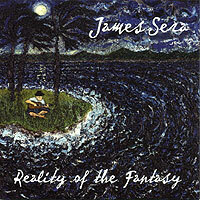 mwe3: Can you say something about the excellent cover art of Reality Of The Fantasy CD and who designed it? What does it say to you? It’s great to see you put so much effort into the design and look of the CD, especially in an era when some artists aren’t even pressing actual CDs. JS: The art work was done by Teri Ann Proschuk. I love the art work. Teri was really close to the music and had understanding of it. I think she really captured the essence of the album. Most of the music we listen to is a collaboration of different musicians and instruments playing together creating one big unified sound. For me there is something that is lonely about solo instrumental music, there is also something very liberating to it as well. I love that it is me playing by myself on this little deserted island in stormy weather with the raging sea in the background. I think it gives the listener a glimpse of what the music or story of the album is all about. The use of the color blue signifies sadness and storms usually signify struggles or turmoil. Being alone with a guitar in the vast open ocean, like a spec of sand in the desert. mwe3: Music is such an excellent respite from the hard world right? How about musical therapy, your CD has that therapeutic effect on people, making them calm and relaxed. JS: Thank You, the music is supposed to be therapeutic. We live in this fast paced world. Everything is so fast these days, you blink and it's gone. So this music is really a nice alternative. I think people are looking for something that doesn't have all these quick edits. Something that is hypnotic and yet relaxing. The music these days can be so compressed and loud. I think there is a real need for something that is not so loud, fast and busy. Something that breathes and lingers. I am a music nerd, so when I'm not playing, I love to see live music. To me that is one of life's greatest sensations. For instance, to see Chick Corea and John McLaughlin in a jazz club six feet away from you is mind blowing or seeing The Kronos Quartet at Carnegie Hall performing Steve Reich's WTC 9/11 composition... I'm looking forward to a lot of good shows this year. Van Halen, Roger Waters, Tool. One of the good things about living in Brooklyn is that there are so many quality shows for like ten dollars, and all different types of quality music too. mwe3: What are the plans for 2012 as far as getting your CD heard far and wide?